The fences are up and the detours have begun. The Arboretum Waterway Maintenance and Enhancement Project is officially underway! HOW WILL THE CONSTRUCTION IMPACT YOUR VISITS? The Arboretum GATEway Garden (just behind the Davis Commons Shopping Center) will remain open. The pathways adjacent to our Australian and New Zealand collection will close. Although pathways closest to the waterway may not be available, the detours around the construction zones should not impede your course direction or distance since nearby upper pathways and lightly traveled roads will remain open. Special note to bicyclists and pedestrians, do be aware that you will be sharing paths in these areas with each other more so than usual. The pathways north of the waterway (near Aggie Village) can get busy at certain times of the day. We suggest that pedestrians stick to the detours on the south side of the construction zone for this reason. VISIT the Arboretum Waterway Maintenance and Enhancement Project page to stay up to date on our progress. 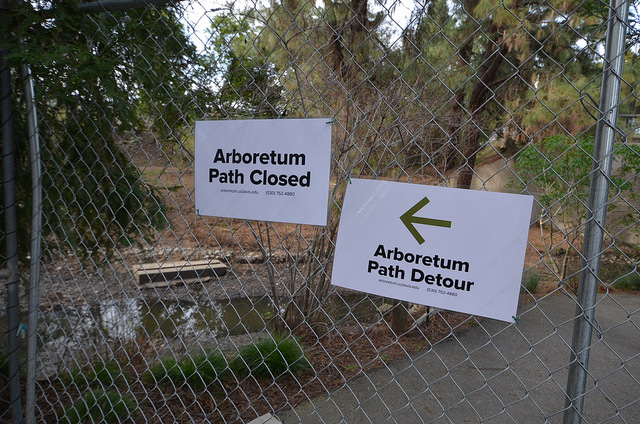 For more information also read the UC Davis Dateline article: Arboretum paths to close for construction. Click here to see more photos of the UC Davis Arboretum and Public Garden.